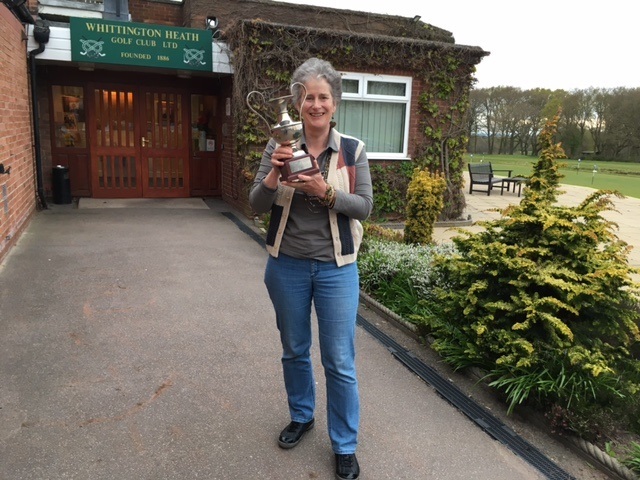 For years Mum and I used to go on jaunts to Wentworth to watch the golf, whether it was in May for the PGA Championship or in October when it was the World Matchplay. My favourite was always the October trip. We watched thrilling head-to-head duels round the West course and witnessed swashbuckling Seve at his Spanish best and Ernie Els, he of the sublime tempo, triumphing on more than one occasion to our huge delight. We went prepared for anything the weather could throw at us, usually did two rounds and we’d stop off in the tented village for a welcome coffee and sandwich at the halfway point. I remember pushing Mum up the hills so she wouldn’t slip in her wellies on the tricky slopes and we sidestepped our way down the other side. They were long, tiring, exhilarating days – golf fans generally have to work hard to enjoy their sport – but it was fantastic, great and fuelled my ambitions of perhaps one day being world No 1. There was only one star of the show and that was the golf. 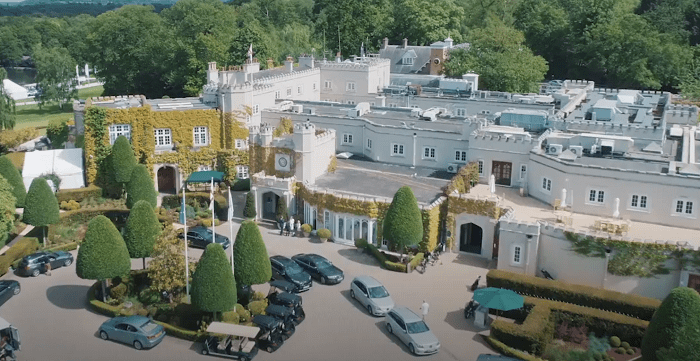 So many great tournaments have been staged at Wentworth. This week the 2017 BMWPGA Championship has so much going on outside the ropes you would be forgiven for not actually making it onto the golf course at all. By the time you’ve tried your hand at the 100 feet putting challenge and stepped into the virtual worlds of golf and cars (BMWs naturally) your heroes will already be on the back nine. You can create a film clip of yourself playing a shot into Wentworth’s final green, then try the virtual hole-in-one challenge before testing your reflexes with the radio-controlled cars on the BMW M race track. Challenges abound at every turn and then there are the shops, with the pro’s shop alongside a BMW Lifestyle shop – and that’s all before you stumble on “The Showstage”. Pardon? Yep – that’s right – a stage where Status Quo will be belting out their numbers on Saturday evening and on Sunday it’ll be the turn of the Kaiser Chiefs. Wow! 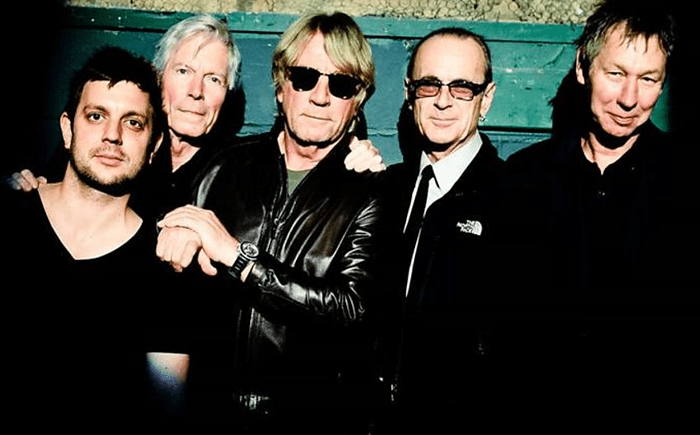 Status Quo – only one of the weekend’s stellar rock acts. You don’t have to wait until the weekend for the music to start, however. The players have provided their favourite tracks to be played over the loud speaker systems at the practice ground while they warm up and when they arrive at the first tee there will be a couple of announcers keeping the grandstands up to date with who’s done what before handing over to the official starter, Alistair Scott. Don’t suppose 6’5″ defending champion Chris Wood strode onto the 1st tee to Val Doonican’s Walk Tall? All the razzmatazz will be supported by numerous izzy-whizzy apps and digital platforms informing us of everything at every conceivable turn. No need to walk a step – or, indeed, watch a single shot that matters. And the cost? That’s one of the most amazing facts of all. An adult can buy a season e-ticket for £85 which covers entry from Tuesday to Sunday inclusive, as well as admission to the Saturday and Sunday concerts. 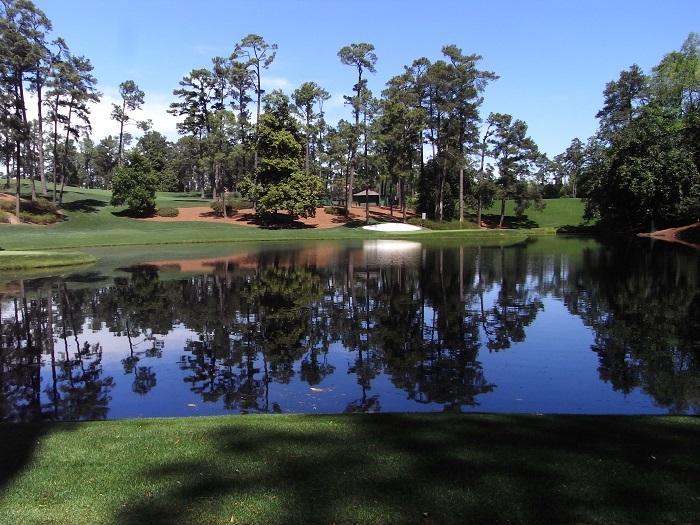 Of course, these initiatives are all part of a drive to make golf more universally appealing and to win over fans from the other numerous sports and pastimes competing for their attention, time and money. Are we not concentrating too much, however, on the peripherals instead of the actual golf ? I do get the need to have all these extra hooks to bring people in to the sport but we need to engender their interest in the sport itself and then sustain and maintain that, hopefully fanning those flames into a passion. The golf was the star of the show. Oops! Forgot to put in the results of last week’s Name That Coach quiz on Friday! A big pat on the back to those of you who scored a full house. Not the greatest start to the week at Manchester airport. 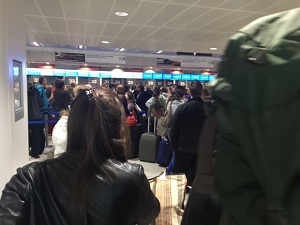 Despite checking in online the previous evening I discovered that American Airlines still require anyone who is travelling anywhere with them to join this queue. Almost 2 hours later I hadn’t even got rid of my suitcase and was left with ten minutes to clear security and leg it to the gate. No time for a coffee, a loo stop – nothing! Altogether too stressful! 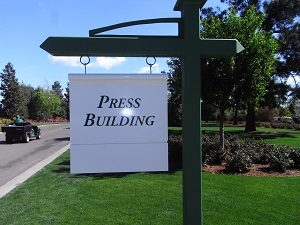 Things are looking up – new facilities this year for the media. 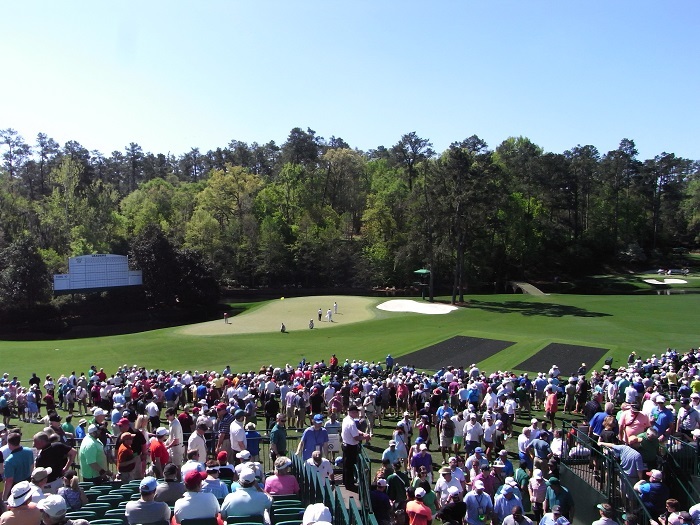 The 12th – Golden Bell, the heart of Amen Corner. 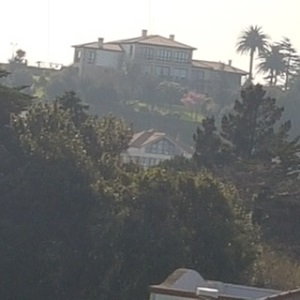 Stalking the players – all in the name of research! 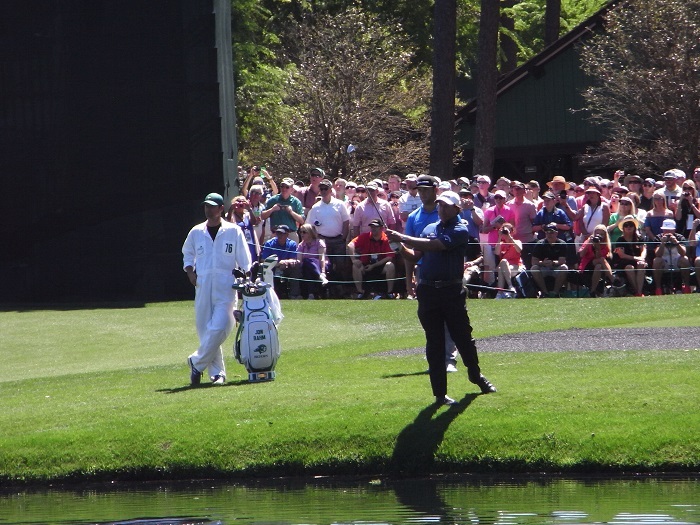 Phil Mickelson and Jon Rahm try their hand at skipping the ball across the water on 16th – a Masters tradition. And look who you bump into! 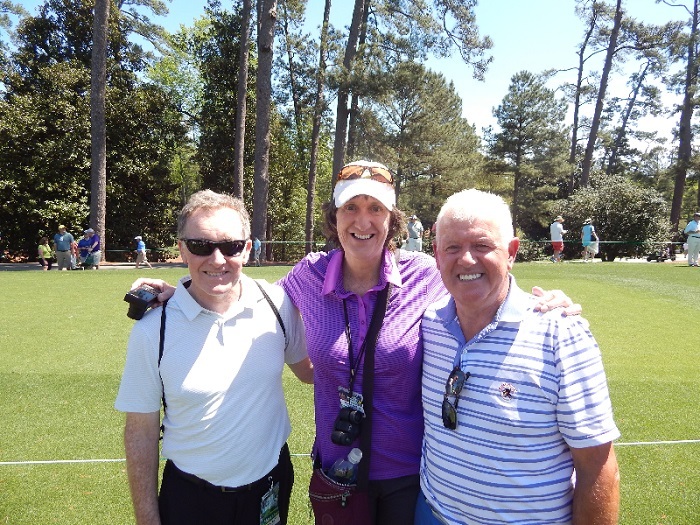 Team Rory: Michael Bannon, coach and Gerry McIlroy, Dad. The Par 3 course is immaculately prepared for the Wednesday afternoon competition. Alas, this year huge thunderstorms meant it was abandoned. 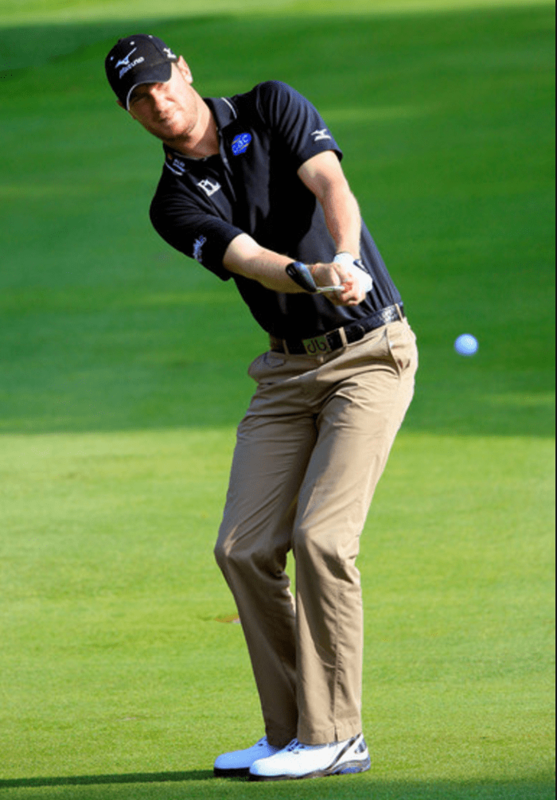 Remember Danny Willett won last year? He learned about Jordan Spieth’s meltdown on the 12th as he was walking to the 16th tee and he also learned he had assumed the lead for the first time. 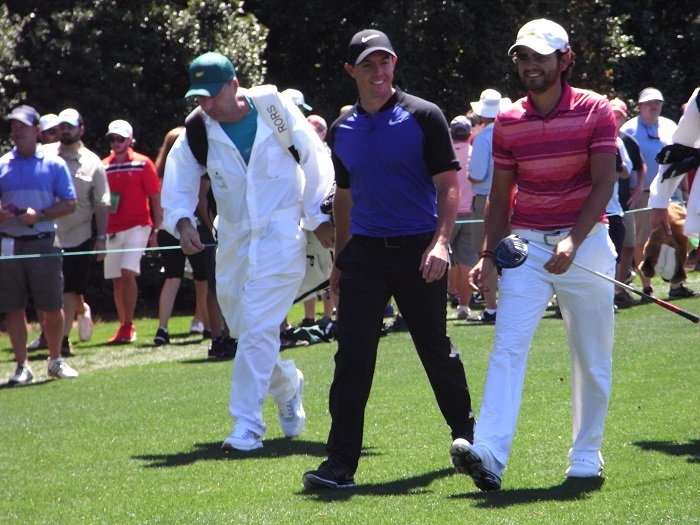 He ran to the loo at the back of the tee to compose himself and deliver the pep talk that saw him stride to victory. 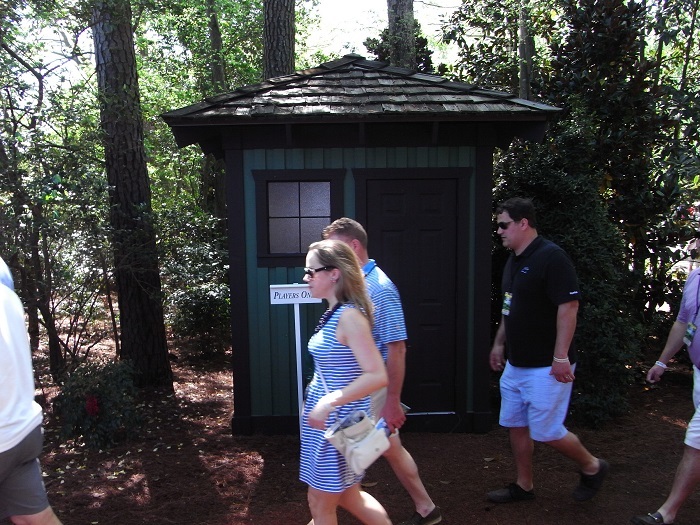 Danny’s loo behind the 16th tee. 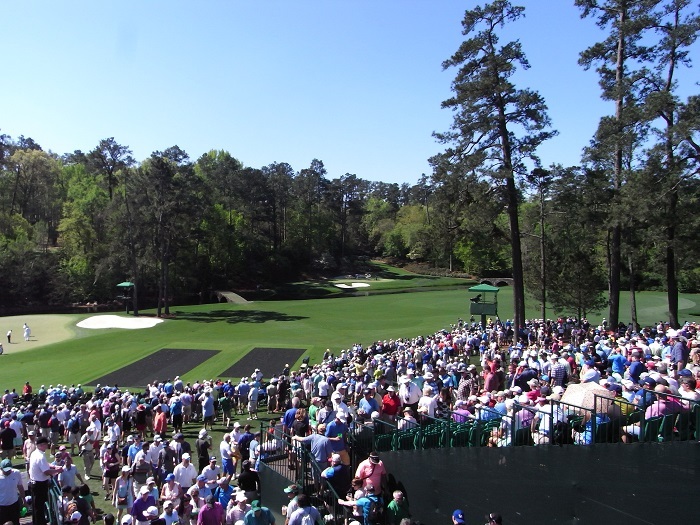 I was working for Westwood One Sports while at Augusta, the radio arm of CBS television. This was my second year with this crew and they are just fantastic. 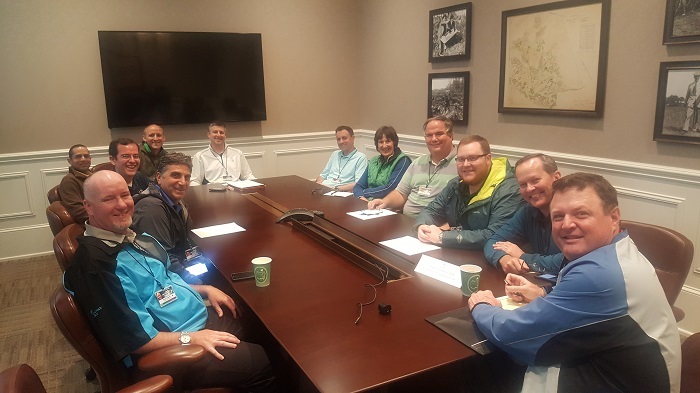 This is the team at a production meeting on the Wednesday, ironing out the finer details before Thursday’s first round. The majors aren’t just majors for the players, you know. 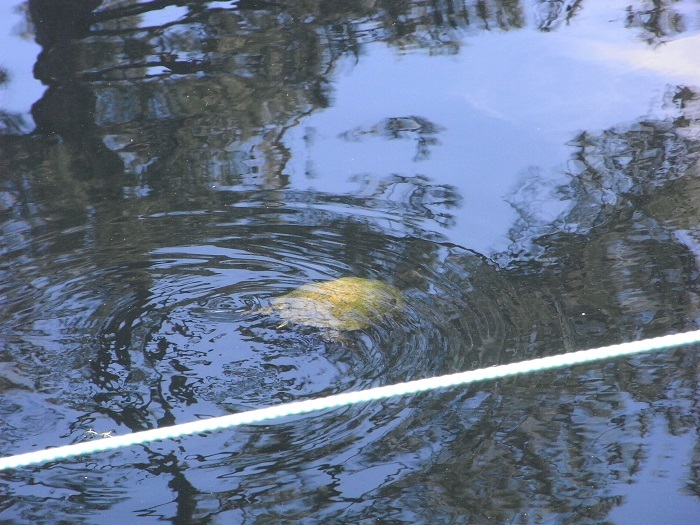 And now for the accomplishment of the week – step (or swim) forward Mr Turtle! Aside from players and caddies the only other living thing inside the rope line – the turtle! 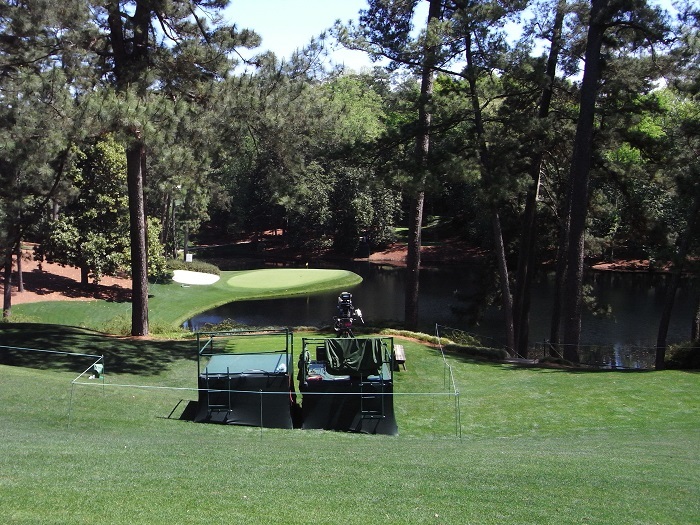 This is where my pictorial diary of the 2017 Masters comes to a close – and yes, it finishes on the Wednesday because there is a very strict no camera policy on the course after the practice days. Even working media are forbidden from carrying phones on any day when outside the Press Building and colleagues have had their credentials revoked for leaving said building – even when the phone was switched off and in their pocket. So, I leave you with one final picture. 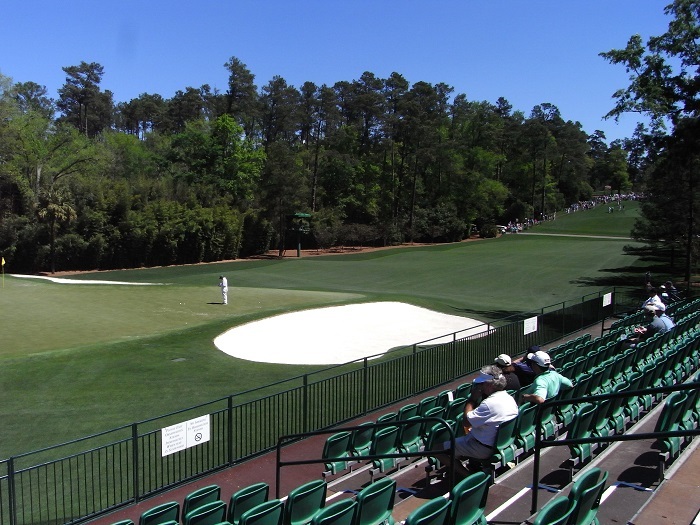 This man has contravened one of Augusta National’s most sacred rules. Take a good look at him – it’s unlikely you’ll see him in 2018! First Seve, then Chema and, now, at last, Sergio. 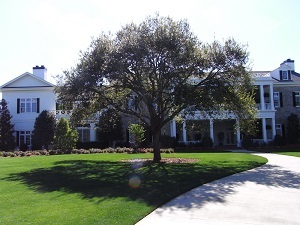 The third Spaniard to win a green jacket at Augusta National came good just when we were all beginning to think that he’d blown his chances of ever winning a major and was destined to be a nearly man, a very, very good but never a great. At least now he’s a very, very good with a major title to his name and contentment in his heart. 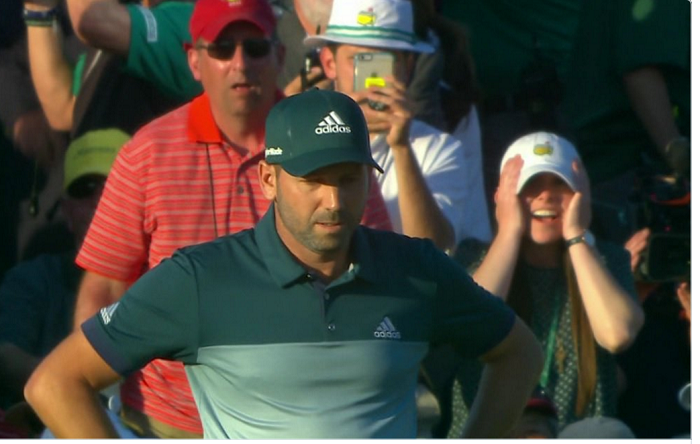 As the Masters became a tussle between Sergio and Justin, head to head, toe to toe, mano a mano in the final pairing, I was torn. I didn’t want either of them to lose, especially as the round wore on and they both produced some terrific stuff as the tension increased. I thought the spirit of Seve, who would have been 60 last Sunday, might see in Sergio’s birdie putt on the 72nd hole, the perfect end to a compelling contest but, no, they had to have another go and Justin’s drive into the trees proved too much of a handicap for the Englishman. The Rose family accepted defeat with their usual grace, hugging Sergio and hiding their own disappointment as they took pleasure in his delight. The Spaniard’s fiancee Angela Akins, an American, gave him plenty of space to savour the moment, only joining him as he was leaving the green. All in all, a very emotional occasion and so far I haven’t come across a single English person who wasn’t happy that he’d won his major at last. Even Spain, the land of football and tennis, has perked up and noticed golf again. 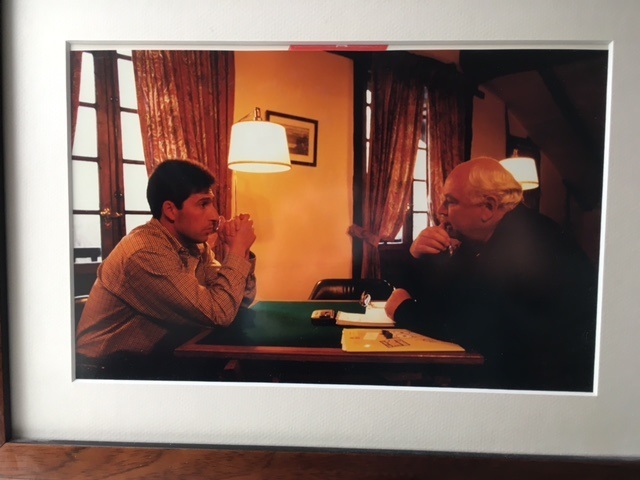 And as a bonus Jon Rahm, the young man who did so well in his first Masters, reminds quite a few old-timers of Seve, with his ambition and self-belief and that je ne sais quoi (sorry, wrong lingo) called charisma. Seve was a force of nature and we all loved him, even though we were not blind to his faults. He could be moody, mean, bad-tempered, stubborn but we’d forgive him almost everything because of his genius and his humanity. And, of course, we didn’t have to live with him. At a tournament in Japan many years ago, I admired a sleeveless cardi Seve was wearing. It was his own label, worn in Japan and unlike most of the stuff he wore in Europe. A couple of days later he gave it to me, looked at Dai, my rather rotund husband, shrugged, smiled and said, “I don’t have anything to fit you.” Killer pause: “Except, perhaps, socks.” Collapse of all parties, stout and otherwise. If you saw Seve in his prime, or anywhere near it, you had to love him. He was electrifying, he made staid, old golf exciting, explosive, entertaining. And he and his contemporaries – all born within a year of each other – made European golf a force in the world. Sandy Lyle, Bernhard Langer, Nick Faldo, Ian Woosnam, all major winners inspired by the passion of a mercurial Spaniard. Olly and Dai, men of golf.